When traveling I try to keep my toiletries and makeup to a bare minimum. In the past I've had tendencies to overpack and throw just about anything in the suitcase for those "just in case" moments, but not anymore. Throughout the years I've learned what works best, how much to bring, and what exactly is worth tugging along. One thing has remained the same, though: my top must-have toiletries. 2.) Kenra Volume Hairspray- Nothing's worse than spritzing your ponytail or pretty curls only to find dried up hairspray flakes all over your head later on the day. It seems like I've tried every promising "no-flake" product on the shelf, and somehow, the white flakes still appear. Not with this, though. It has a strong hold, smells nice, and is easy to work with. Plus, this even comes in a travel size. Win! 3.) Jojoba Oil- This right here is my 3-in-1 facial product. It removes makeup, including stubborn mascara and eyeliner, cleans the face, and moisturizes the skin. During the evening, I even apply a little dab around the eye area to help prevent fine lines and wrinkles. See more of my favorites in this video here (including my go-to makeup products). This is also the travel bag I use and the items I carry on. 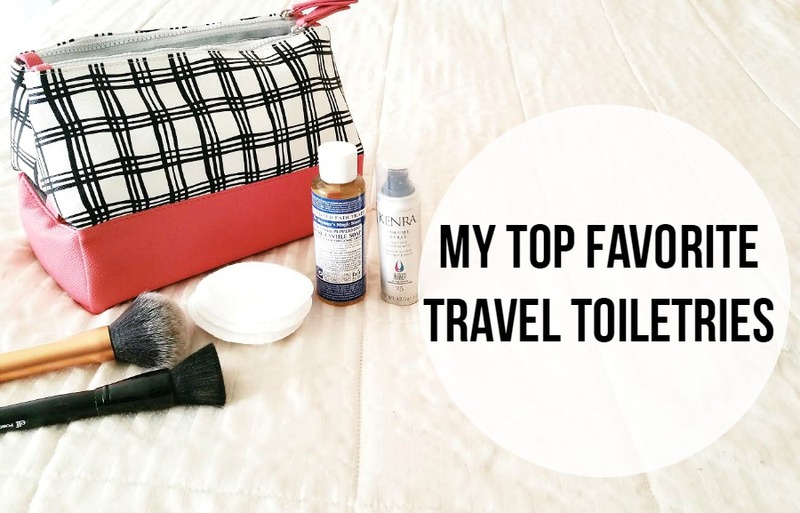 What are your must have travel toiletries?